Above red lipstick, purple lip colours reign as my “power colour” – my ultimate confidence-boosting shade. My love for purple lipstick began during a time when the selection for such a colour was very small. In fact, I only started out with two – and mind you, they were not easy to find. I even resorted to using a purple eyeliner or eyeshadow mixed with clear lip gloss. 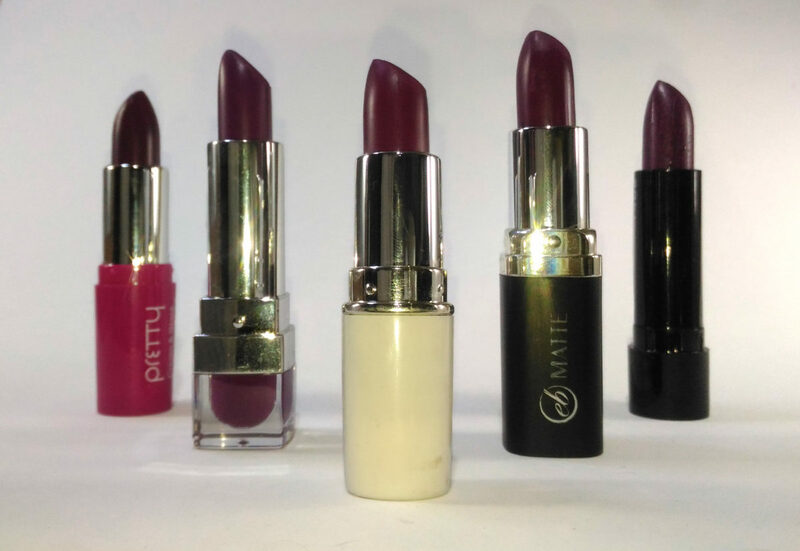 Back then, purple was considered a “weird” shade for a lipstick, something you would only buy for a Halloween party. Last year (2016), purple suddenly blew up. People started wearing it more often and brands jumped on the bandwagon and started producing their own purple shades. Can you imagine how delighted I was? It was heaven for me! Maybelline Color Show lipstick in “403 Plum Perfect” – The subtle plum hue combined with the sheer formula makes this a great entry level lipstick to try out purple as it leans more towards pink. Wet n Wild Megalast lipstick in “908C Sugar Plum Fairy” – This drugstore dupe for MAC Rebel is a beautiful mix of purple and pink. It’s definitely a lot bolder and stronger than the previously mentioned lipstick. 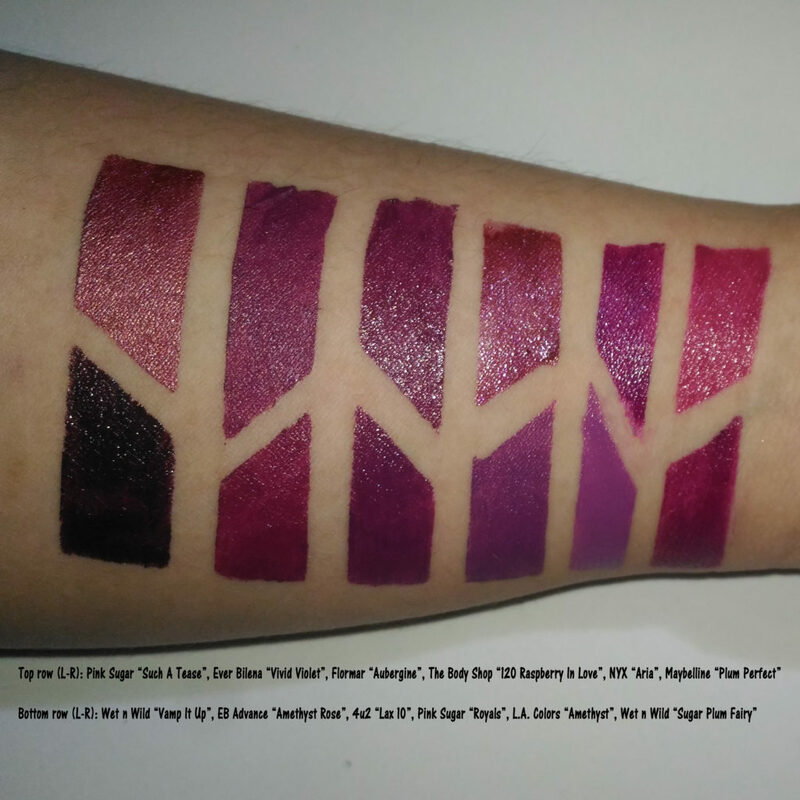 NYX Matte lipstick in “Aria” – Aria is very similar to WnW Sugar Plum Fairy, except it’s the slightest bit more purple/less pink. L.A. Colors Matte lipstick in “Amethyst” – This was my second purple lipstick. (My very first one was from Aido.) This was my first “true” purple lipstick; though, looking at it now next to my other purple lipsticks, it looks significantly lighter and more pastel. If my memory serves me right, this retailed for PHP 99 back then. It’s not the best formula out there, but I included it in this list because it’s a good option for when you’re not ready to invest in a tube of purple lipstick. The Body Shop Colour Crush lipstick in “120 Raspberry In Love” – This shimmery purple toned wine shade has a sheer formula which makes it both bold, yet wearable. Pink Sugar Matte lipstick in “Royals” – This is probably my favourite one! I love the deep purple shade and the matte formula. This is my most worn out of all my purple lipsticks. This reminds me of MAC “Heroine”. Flormar Pretty Cream & Glaze lipstick in “Aubergine” – True to its name, this shade is very reminiscent of an eggplant. 4u2 Lipaholic lipstick in “Lax 10” – This is a more purple version of Flormar Aubergine – meaning, it has a less of the slight reddish hue that Aubergine has. To the untrained eye, they’re practically twins. Ever Bilena Matte lipstick in “Vivid Violet” – Ever Bilena was my first brand of matte lipstick. So, I was delighted when they came out with a purple shade. I just had to get it! The formula seems to have changed since my last purchase many years ago. Anyway, it’s like a matte version of Flormar Aubergine. EB Advance Supreme lipstick in “Amethyst Rose” – I also picked up EB Vivid Violet’s sister, EB Advance Amethyst Rose. To be completely honest, I love the formula of this line more than the original matte lipsticks because they wear better on my dry lips. It’s a tad bit redder than Vivid Violet. Pink Sugar HD lipstick in “Such a Tease” – This isn’t a true bold purple; rather, it looks like a blend of purple, red, and brown. I can’t quite describe it. It is also metallic! It’s a very unique shade in my stash – a must have! Wet n Wild Megalast lipstick in “Vamp it Up” – This almost-black purple shade is very aptly named “Vamp it Up” due to its very vampy, gothic feel. Definitely not for the faint of heart! It’s a great dupe for MAC “Cyber”. What is YOUR power colour? Also, would you give purple lipsticks a try? Let me know in the comments! Red lipstick is a classic and timeless lipstick colour. 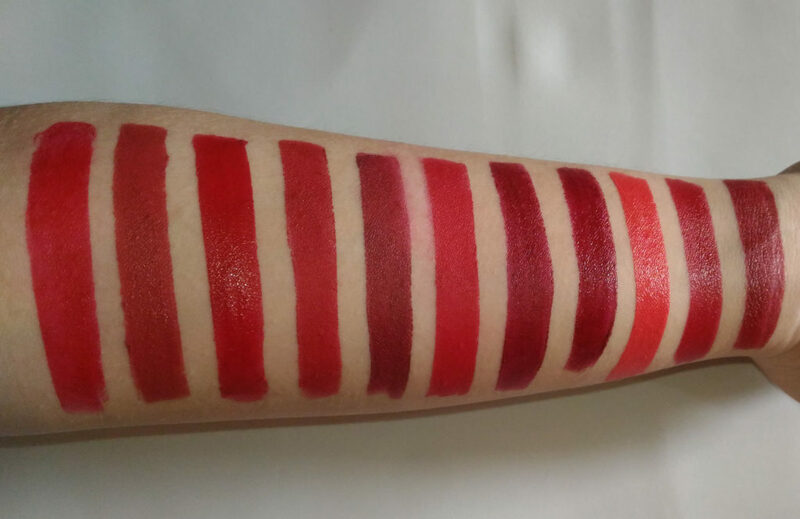 The bold rouge is not everyone’s cup of tea; but, I think we can all agree that every makeup lover probably has at least one tube in their collection. It’s definitely a “power colour” that just screams confidence! I started experimenting with lipstick at a young age. So, I am no stranger to the struggles of finding the perfect red lipstick. I absolutely love red lipstick! I have collected a wide variety of reds through the years, and these are the ones that stood out the most to me. Wet n Wild Megalast Lipstick in “Stoplight Red” – A bright, classic true red. This is one of the most popular red lipsticks in the drugstore because of the impressive quality for the inexpensive price. This is known to be a great dupe for the ever-famous MAC Ruby Woo. Revlon Super Lustrous Lipstick in “Wine with Everything” – A muted brick red. This shade is a very toned down red with slight brown and orange tones to it. It’s a good starter red for those who are just trying to ease their way into trying red lipsticks. Shawill Vogue Noble Steady Color Lipstick in “07” – A bright red with blue undertones. Ah, memories. I wore this lipstick to my Junior Prom in high school. I even reviewed this in my old blog! The smooth, balm-like formula makes it super hydrating and comfortable to wear, and the superb pigmentation is stunning! And for the price tag of PHP 128? It’s a great deal! Maybelline Creamy Matte Lipstick in “Rich Ruby” – A classic, cool-toned red. I reach for this when I was a casual, no-fuss red lip with minimal makeup on. Maybelline Creamy Matte Lipstick in “Divine Wine” – A deep wine/Oxblood red. This is such a gorgeous deep wine shade! L’oreal Matte Red in “Pure Rouge” – A blue-based red on me. In the tube, it looks more like a true red. On some skin tones, this tends to look warm. 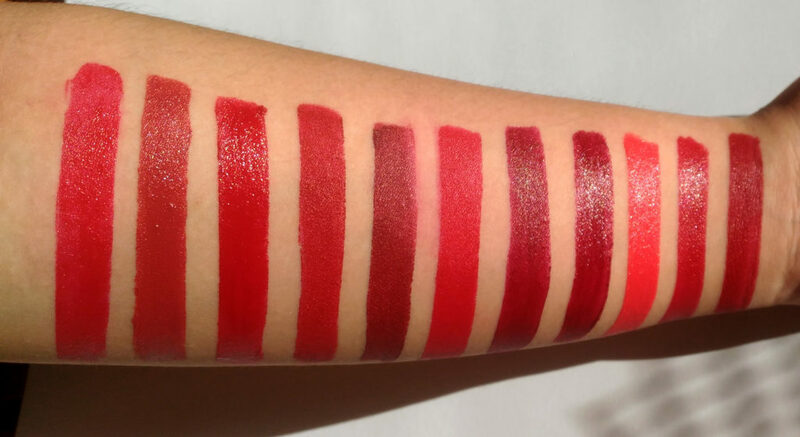 It is also a dupe for MAC Ruby Woo, which is also known to adapt to the wearer’s skin tone. L’oreal Matte Red in “Pure Garnet” – A deep, burgundy hue that leans towards berry on my lips. Colourette Colourstick in “Persia” – A deep red with blue undertones. It’s quite a vampy shade. Sooper Beaute So Matte Lipstick in “Red-dy For You” – A warm, orangey red. It’s a summery shade of red. Napoleon Perdis Set Lipstick in “Madrid” – A glossy red with slight blue undertones. I feel bad for including this in the list because it is not available locally. Napoleon Perdis is an Australian brand. Their face primer is included in my Ride or Die/2016 Favourites. It’s just such a beautiful red shade with a very comfortable formula. I used this in a makeup gig recently and the clients loved it! MAC Matte Lipstick in “Russian Red” – I’m not the biggest fan of MAC cosmetics in general. I have my opinions about the brand. However, I cannot deny that it is an oldie, but a goodie kind of classic. MAC Russian Red is equally just as famous as its sister, Ruby Woo. It’s a little less bright a bit cooler than RW. I do reach for my L’oreal Pure Rouge more than this; but, I still think it’s a great red that deserves recognition in this list. That’s all for now! 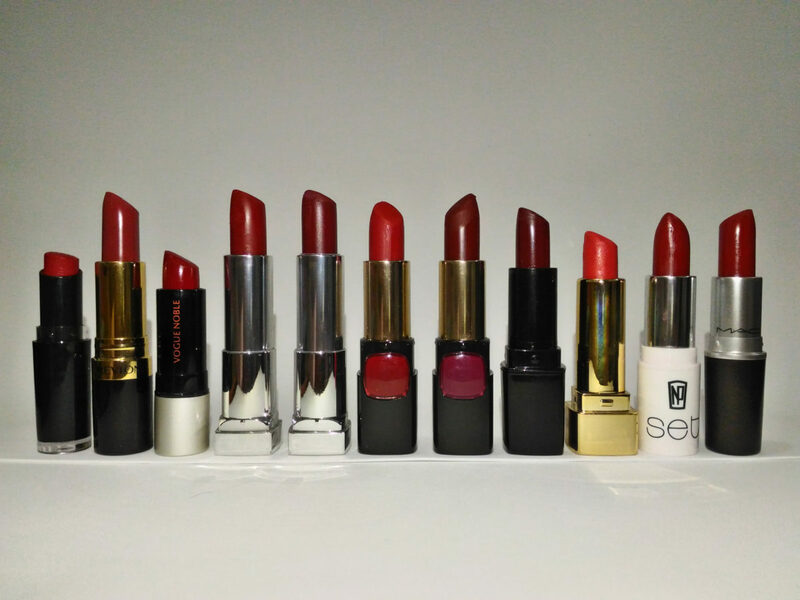 What is your favourite red lipstick? Leave a comment and let me know!